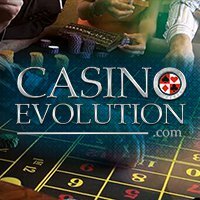 Complete with the top features of successful Bitcoin casinos, Casino Evolution is a strong contender for earning a spot in the list of the best gambling sites in the cryptocurrency market today. It caters not only to Bitcoin bettors from as many countries as possible but also to altcoins like Litecoin and Peercoin. With a wider market for online casino enthusiasts and a full range of Bitcoin games, this website is capable of providing unparalleled entertainment and excitement, even to Bitcoin poker fanatics. The leading online casino software provider SoftSwiss is responsible for the turnkey solutions this casino operates with. Known for its provably fair games and innovative technology, SoftSwiss enables Casino Evolution to forward revolutionary gameplay to its customers. From the popular Bitcoin slots, roulette, to blackjack, this website has it all; thanks to its game inventory that houses more than 30 high-quality games. Among the offerings in this casino are the Bitcoin poker game variants, such as Carribean Poker, Casin Hold’em, Oasis Poker, Trey Poker, Let it Ride, and Texas Hold’em. 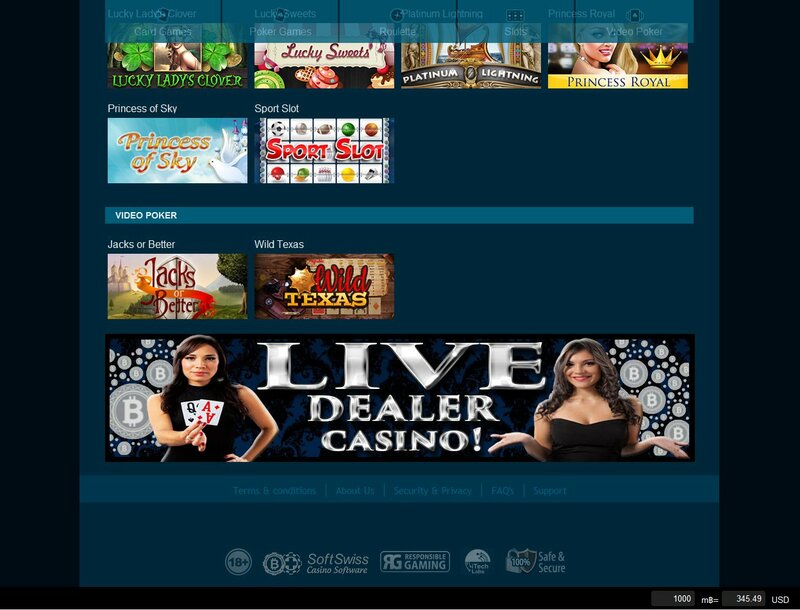 However, given that this is casino and not a Bitcoin poker room, the games are computer-generated instead of the typical poker rooms played by real players online (poker is not included in its live dealer casino too). Nevertheless, these games boast high-definition graphics, smooth gameplay, and verifiably fair system. The fact that they can also be played on mobile devices makes the casino and the Bitcoin poker games all the more fun and convenient to play. With the freedom to use any of the three cryptos accepted on this platform, players are guaranteed to enjoy the flexibility of betting in this casino. It would be more fitting to its name, however, if it will support more altcoins to target a larger base of customers. Its players can also benefit from the anonymous accounts available in various countries, even in the US. However, it is important to point out that account registration requires email activation. Therefore, ensure that the provided email address is accessible in order to complete the sign up. 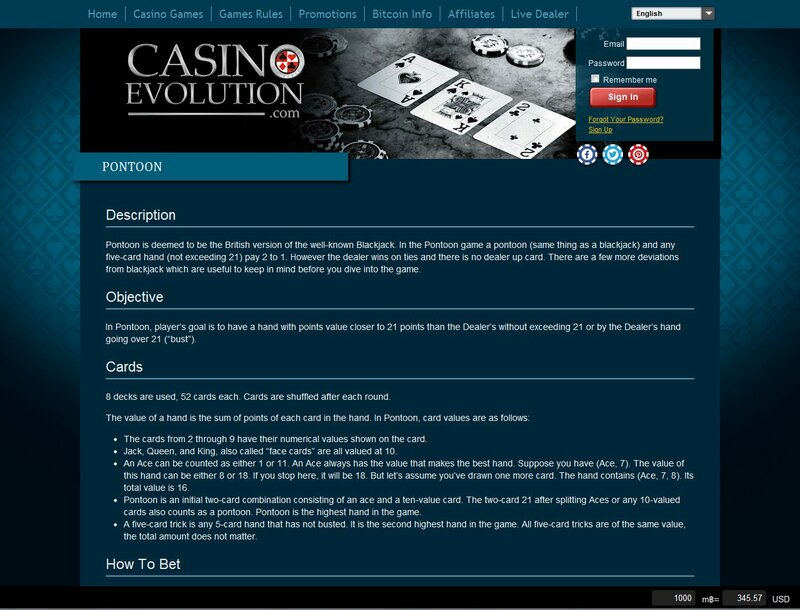 Meanwhile, Casino Evolution offers unregistered players to check out its game through the free credits available in the Free Play mode. A total of 10,000 credits can be used to bet on all of the Bitcoin casino games with exceptions of the live dealer casino. 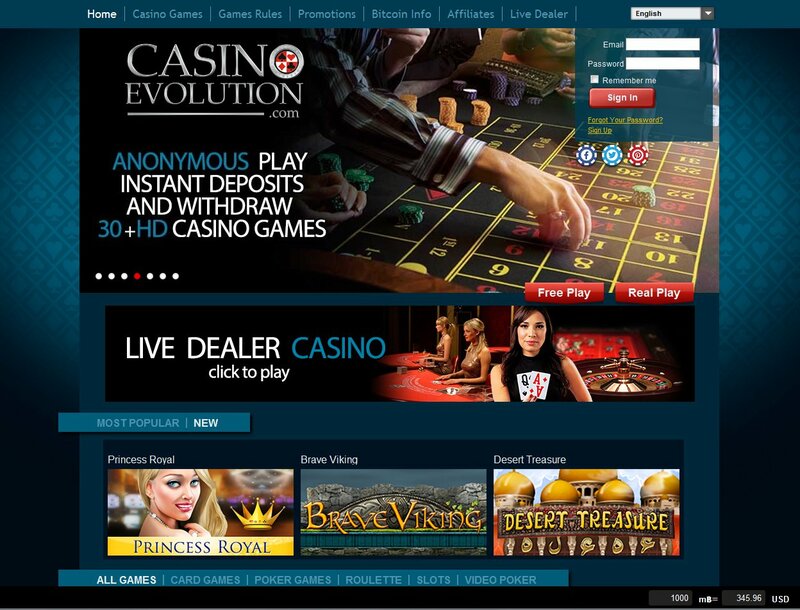 This Bitcoin casino comes with a competitive affiliate program. It rewards its affiliates with a 33% revenue share free of restrictions and chargebacks. The payouts are done twice weekly, and the payments may be done in the preferred cryptocurrency. It also comes with a host of regular bonuses like the 100% Welcome Bonus, together with the special and monthly promotions that keep the gambling experience more exciting and rewarding. 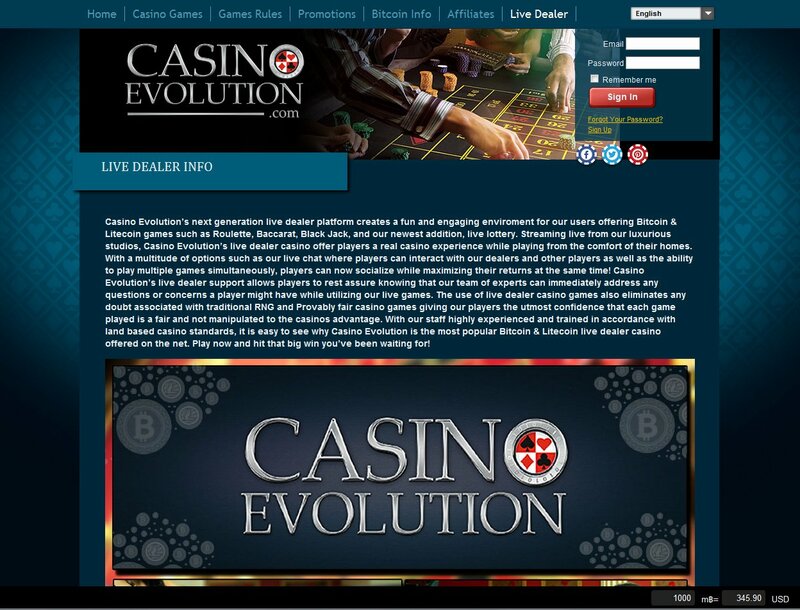 Although lacking an actual Bitcoin poker room, Casino Evolution passes as an excellent venue on the web to wager on some of the poker variants in the Bitcoin casino market. Its support for the three digital currencies also helps in making it an attractive platform online.